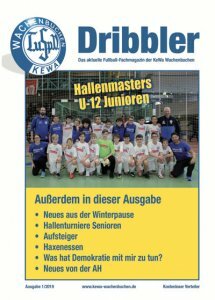 On Wednesday, 07.10.2015 the KeWa Wachenbuchen B-Youth soccer team took on Germania Dörnigheim in Dörnigheim for the 3rd Round of the Kreispokal Hanau. First a bye, then a win followed by a loss of 5-0. The 1st round The Blues had to sit out, just not enough teams to make a game. The 2nd Round KeWa won 3-0 against TSV 1860 Hanau due to the TSV canceling their team. For the 3rd and final Round it would be a Maintal duel against Germania Dörnigheim. The Men in Blue were chosen to play gainst one of the leading teams in the Kreisliga. It turned out to be a very good game, with KeWa doing their best to keep it as lose as possible. The Defense had worked hard the previous weeks on position and tactics with Coach’s Huber and Smiroldo. It paid off, the first half the Germania were held to 2 scores and the 2nd half to 3 goals, keeping the score in single digits. The Striker chances up front were few and far between but The Blues were able to put some pressure on their opponents, giving their Defense a breather. It was a great effort by all in this final game of the Kreispokal Hanau for the Blues against one of the best teams in Kreis Hanau, which included 3 ex-KeWa players D. Zeller, L. Bergmann und M. Trock who all represented their new team very well. Playing for the future – Go Blues!!!! Team: Neufeld, Luekel, Frischkorn, Buchanan, Sierla, Mueller, Eibelshäuser, Gribbin, Dudenkov, Kreitz, Wolzenburg und Olschok.